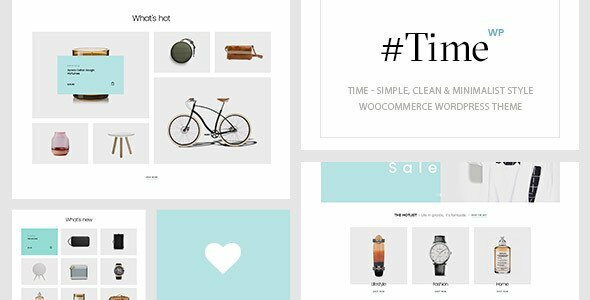 With an inspiration of simple, clean & minimalist style design, Time WooCommerce WordPress Theme brings visitors a friendly looking to build any kinds of e-commerce websites such as fashion store, jewelry, furniture store, decoration store, home appliance, etc. It looks great with all types of devices (laptops, tablets and mobiles). Multilingual ready, RTL ready and WPML compatible so you can use it in any languages. This great theme is impressive with 08+ homepage layouts with different Header Styles good looking appearance, eye-catching layouts and multiple category layouts, product tabs. Time is well structured and clean code ensures a smooth user experience for all visitors. Especially, It is completely optimized for Speed, Search Engine Optimization, Mobile Optimized, Highly Conversion Rate Optimization and Unlimited Customize. Furthermore, Time is integrated with WooCommerce, many plugins with lots of features, mini cart, custom widgets, unlimited color schemes, Slider with smooth transition effects, Menu with multiple column styles and advanced widgets, King Composer – the fastest page builder, stunning portfolio showcase, stylist blog platform… You are free to control this theme in order to make your store more friendly and adorable for your customers.